Hi, I am interested in your 1984 Ford Mustang (stock #5090-CHA) listed on Autotrader for $12,995. I'd like to get more information about this vehicle and confirm its availability. The 5.0 already has a legendary reputation, and now its beginning to become a valued classic. 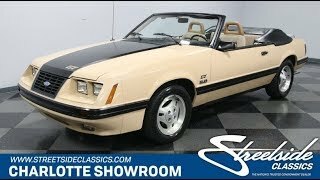 Thats why its important to take a closer look at this 1984 Ford Mustang GT convertible. With a five-speed stick, cool colors, and loaded A/C interior, its a droptop classic with true distinction. The eye-catching color combo is factory-correct. The 80s-cool Light Desert Tan is the ideal backdrop of the GTs well-coordinated dark side. After all, you not only get the distinctive hood stripe, but it matches the black rub strip that encircles the entire body. All this black on the body means the black roof looks fantastic when its in place. And more than just the colors, this one has appeal in the correct details. It looks like a time capsule, right down to the fog lights, luggage rack on the trunk, and the special GT wheels. As much as we like it with the roof up, convertibles are always meant to be open to the world. So we love that this has such a well-preserved tan interior. Everything remains in its stock appearance, including the dual-spoke steering wheel and the original full gauge panel with large speedo and tach. Plus, this one came loaded with amenities such as cruise control, the original AM/FM/cassette stereo, and well-bolstered sport seats finished in a comfortable cloth. But the features we think youll love the best are the power windows and a power convertible top. When used together, it means you dont have to leave the drivers seat to go from enclosed comfort to a wind-in-your-hair experience. Because the air conditioning is blowing cold, you can even enjoy this droptop in the summertime. The 5.0 High Output V8 is a legend in American performance for delivering plenty of power in a stout package. This is one of the last years for the four-barrel carb, which makes it great for modification. But on a classic as period-correct a this, were quite happy to see this looking all stock on what is believed to be the original motor. The five-speed manual transmission gives you full control over this V8. Plus, this classic has great anytime driving features like power steering, front disc brakes, and sway bars front & rear. This is the cool-looking droptop that has all the feature and distinction you want. So when its all offered for an obtainable price, you dont want to let this deal slip away. Call now!